Twill patterns of weaving seem to have developed early in the first millennium B.C.E. Hallstatt culture in Europe. 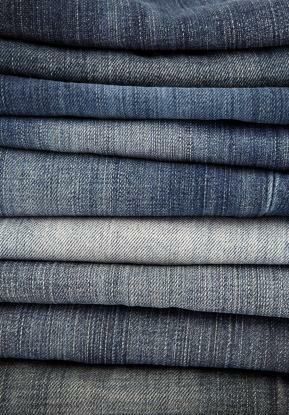 Technically speaking, denim is a warp-faced twill weave fabric. The most basic twill weave calls for passing the weft (crosswise) yarn over two and under two warp (lengthwise) yarns (2/2 twill), a pairing that gives the pattern its name, two-ing or twill. In warp-faced twills, warp yarns are predominant on the front or face of the fabric and because warp yarns have a higher twist, the resulting fabric is stronger than many other weaves. In denim, the warp-faced twill pattern calls for passing the weft yarn over one and under two (1/2), or over one and under three warp (1/3) yarns. Because there are fewer lacings in twills than in plain weaves, the yarns are freer to move when being worn resulting in a fabric that is both flexible and resilient. The fewer the lacings, as in twills compared to plain weaves, the closer together yarns may be packed, thus producing a higher number of yarns per inch, making the resulting fabric stronger yet. Popularly speaking, denim has been associated with fabric coloring, garment style, and lifestyle. Whole books have been written about twentieth-century denim and its popularity with teenagers and celebrities. The word has become so popular and generic in its use that rock bands, stage troupes, and even bottled water, have taken the name denim. The name itself is derived from Nimes, a small city in southern France that had long been famous for its textile industry. Levi Strauss is given the credit for the common use of denim in the rugged trousers first sold to gold miners during the California gold rush of the 1850s and 1860s. While the twill weave used in those first trousers for gold miners was undeniably hardier than the plain weave that canvas miners had been wearing, it was the metal-riveted pockets that began to appear in the 1860s and 1870s that most interested the miners. Jacob Davis, a tailor and wholesale customer of Levi Strauss, came up with the idea of putting metal rivets at the points of stress on denim trousers. Strauss hired Jacob Davis to oversee the manufacturing in San Francisco of the blue denim "waist overalls" as they were called. On 20 May 1873, Davis and Strauss received patent #139,121 from the U.S. Patent and Trademark Office for an "Improvement in Fastening Pocket-Openings." The riveted waist overalls were made from denim fabric furnished by the Amoskeag Mill in Manchester, New Hampshire. The waist overalls that are commonly called "jeans" or "blue jeans" were a hit with miners and other workers whose clothing had to be rugged. Cowboys who often spent days, and even nights, in the saddle herding cattle wore the trousers extensively. In the 1900s, denim was most associated with rugged trousers dyed indigo blue. It is not known exactly when or why jeans or waist overalls yarns first began to be dyed blue. One of the best reasons given is that blue seems to hide dirt and stains better than the tan first associated with waist overalls. The uneven surface of twill weaves hides soil as well. Also, because the yarns can be more tightly packed in twills than in plain weaves, the fabric resists soiling by liquid spills. Until the 1920s and 1930s denim waist overalls were scarcely known east of the Mississippi River. They were worn in the West as work pants. From the mid-to-late 1950s and 1960s, blue denim ceased to be used mostly for work clothes. Indigo or blue denim became a hot fashion item. Men's and women's suits were made from denim, as well as evening dresses, which began to be studded with rhinestones instead of rivets. In the 1960s denim blue jeans became one of the signs of rebellion among teenagers and twenty-something young adults. The young rebels, known as hippies and flower children, embroidered their jeans and painted them with flowers, peace signs (in protest of the U.S. involvement in Vietnam), and psychedelic designs. In the 1980s and 1990s, denim became associated with various shades of blue as much as with its twill weave. Sheets, pillowcases, upholstery, bathing suits, dresses, leather and cloth shoes, underwear, paper, and even pencils were called "denim." Wood furniture was stained to have a denim appearance. Almost every well-known European and U.S. designer from Calvin Klein to Giorgio Armani has made denim part of their fashion lines. Denim was seen as an American lifestyle fabrication and style. Denim was no longer the fabric of choice for just the blue-collar worker. It became an upper-class classic, even "preppy" look. Casual denim skirts and trousers were often combined with cashmere jackets and mink or ermine coats on the runway and on the streets. Denim trousers became accepted in high profile, black-tie events, worn with a formal tuxedo shirt and jacket. Virtually the only place where the casual nature of blue jeans remained unacceptable was in the dress of attorneys in the courtroom. Old or vintage blue denim was very popular in the 1980s and 1990s, particularly in Asia and the United States. In Japan, the demand for vintage denim blue jeans was so great in the 1990s that it outstripped supplies. On 26 September 2003, the San Francisco Chronicle announced that in 2004 plant closings would mark the end of the Levi's U.S. jeans-making era. Levi Strauss & Co. was a reflection of more than 150 years of American history, from the rough days of the California Gold Rush and the opening of the wild west, through the Great Depression. The impact of Levis grew during two world wars and Vietnam resulting in fashions that emphasized casual dress and conspicuous consumption simultaneously. Through it all, Levi Strauss & Co. became an icon with undisputed class. Blue denim jeans in the 1990s were decorated extensively with colorful braid and glass bead fringe at the waist and edges of trouser legs. Legs of denim jeans were often slashed from the mid-thigh to the trouser leg edge and then laced with cord. Cotton was combined with latex for a fabrication that could be worn skintight and yet remain comfortably elastic. Denim was produced in colors other than blue, including black, green, pink, and tan- but those colors never attained the popularity of blue denim. In the early 2000s, it appears that denim will never be seen as a fad. It is an international classic. See also Jeans; Levi Strauss & Co.
Barber, E. J. W. Prehistoric Textiles: The Development of Cloth in the Neolithic and Bronze Ages with Special Reference to the Aegean. Princeton, N.J.: Princeton University Press, 1991. Kadolph, Sara J., and Langford, Anna L. Textiles. 8th ed. Upper Saddle River, N.J.: Prentice-Hall, 1998. Levi Strauss & Co. 2001. Available from http://www.levistrauss.com .